Ok. I LOVE marshmallows. They’re goofy and bouncy and silly and happy sorts of things. They are a candy, only not, because they’re full of air, only they are because they’re mostly sugar, only not because somehow when I was a kid, marshmallows weren’t forbidden like everything else was. They go on top of hot chocolate, or on a stick and in the fire, or passed around for people to eat. Huh…you say. The ones from a bag are fine, thankyouverymuch. Sure they are. So is white bread from a bag. Stale white bread. It’s kind of filling and holds cheeze together for a grilled cheeze sammich. Homemade marshmallows are…well, like a fresh loaf of homemade bread still warm, with real butter from a cow and a couple of slices of gouda cheese from the dairy down the road O Yes. Do you understand? Do you get it?! 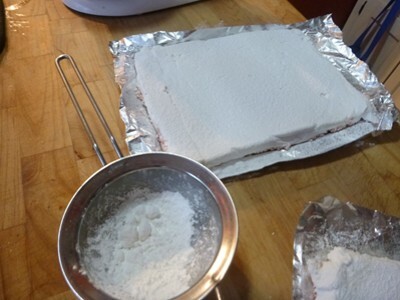 The first time I made…well…attempted to make marshmallows was not quite a dismal failure but they sure weren’t anything I’d give to adults. They didn’t quite set up right, maybe the sugar syrup wasn’t cooked long enough. They were…um…mucusish. Like snot. Gross. Only, the boys were in middle school at the time and they were delighted. So I let them wrap blobs up in waxed paper to give to their friends, who also were delighted. So it wasn’t all bad, but it wasn’t the result that was hoped for. Last year I tried again, this time with a different recipe, a candy thermometer, and the proper equipment. 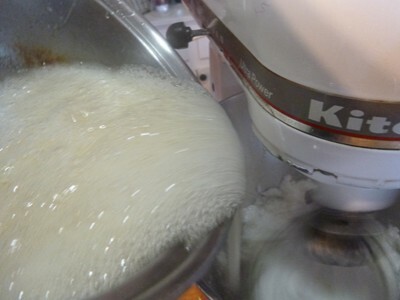 By proper equipment I mean a heavy stand mixer with a whisk, and jelly roll pans. 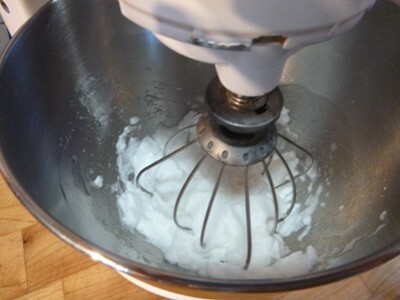 This time I was patient, I let the stuff whip in the bowl for a long, long time- that’s why you’ll want a stand mixer. I suppose if you want to be all “but I’m Old School and I want to do it the Right Way” you can go right ahead and whip it with a big wire whisk in your big crockery bowl and go at it for 20 minutes until your arm falls off, but I am a proponent of modern technology (most of the time, except with the stupid smart phone and I really want my flip phone back even though the candle app is neat). By letting it whip a good 15 minutes you can get everything else cleaned up or even start on a blog post or something! Gather up your stuff! Also, have some powdered sugar and a bottle of good peppermint extract. 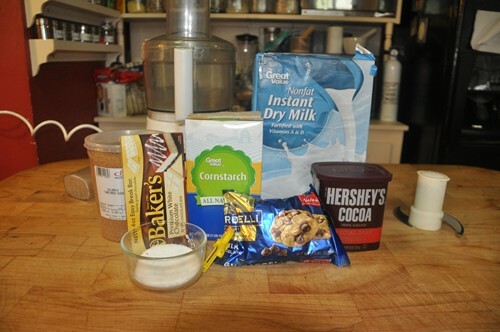 1 cup sifted powered sugar…sifting is important so there’s no lumps. 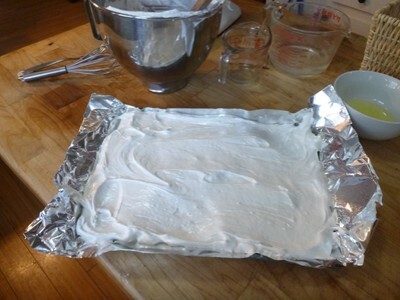 Line a cookie sheet with aluminum foil, making a lip up the sides, and spray with non stick spray. Using a pot bigger than you think you need (trust me on this), put the sugar, corn syrup, and 3/4 cup water in it and put this on the stove on medium-high heat. 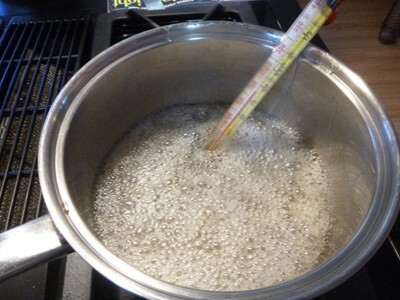 Stir constantly until it comes to a boil, then stick a candy thermometer in and boil until it comes to 260 (soft crack) degrees. While that’s coming up to temp, go do the other stuff. 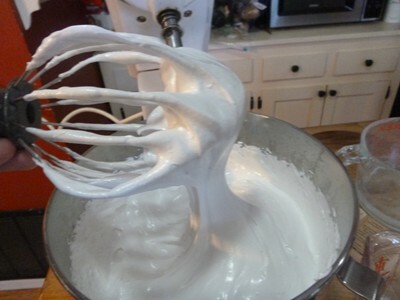 Put the egg whites in the bowl of the stand mixer, and with the wire whip, whip until it’s got stiff peaks. While that’s whipping, go to the next step. When the sugar syrup reaches 260 degree, pour in the gelatin mix. IT WILL FOAM UP, this is why you need a big pot! 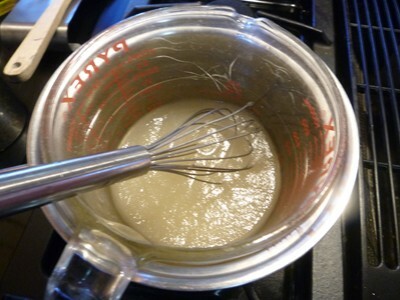 Pour this mixture into the egg white, with the mixer on medium. When it’s blended, turn up to high and let it rip for about 15 minutes. Just let it go, and clean up or write a letter or something. 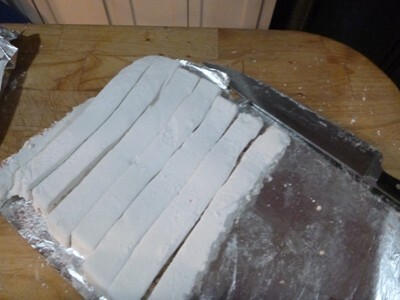 When it’s done, it will be glossy and very thick, and will have cooled off substantially. 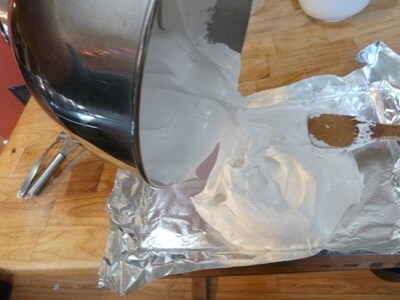 Pour all this onto the greased foil and do the best you can to spread it out evenly. 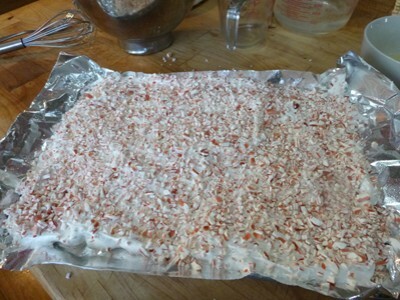 Sprinkle the peppermint chips all over evenly and press into the gooey stuff. Let this sit for several hours (at least 3) UNCOVERED, you can go longer, but you don’t want to let it sit less than 3 hours. Overnight is fine…whatever works. 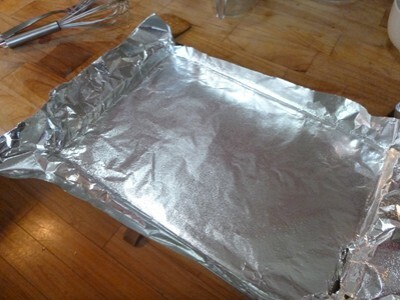 After a couple of hours (or whenever you get to it), flip the whole thing over on another piece of foil, and let it sit for several more hours. Then dust it with some powdered sugar. 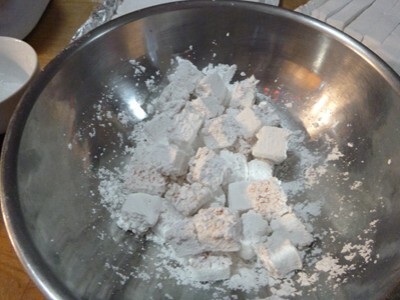 Cut into squares and toss each one in some sifted powdered sugar so they won’t be sticky. I recommend using a big knife with a heavy blade, and make one big chop to cut the slice. You can run the blade through the powered sugar before you make the cut, if it helps. Package up nice and pretty! 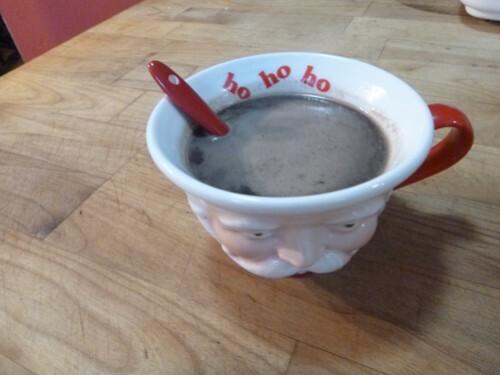 When I was a kid, Mom made hot chocolate mix ever year. It was the one made from the Nestle’s Quik chocolate milk stuff, instant creamer, and powered milk. Now, I grew up with that and like it just fine. But, because this is how we roll around here, I wanted to do something MORE and BETTER, without the powdered instant stuff (well, except for the milk, I guess) and it needed to be Too Good For Children. Of course, that is up to you, what you do with it, sharing and all. I wanted it rich and dark and real and even a little scary, maybe. Like dessert or mousse or something. 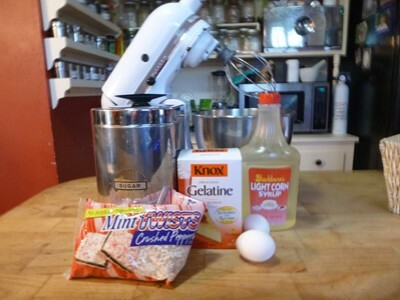 So, I looked up Alton Brown’s recipe, because his recipes are nearly always wonderful, only I didn’t want to use powered sugar because I’d bought a couple of things of turbinado sugar and I like that different flavor it has. And no cayenne pepper. I know it’s all the thing this past few years to go full-on Mayan and add cayenne pepper to the chocolate but I am all “Hey this is the Deep South where we like things the way Mama did it” and Mom didn’t add cayenne to the hot chocolate tho I am pretty sure if someone had told her about it she would have. Mom still is a culinary adventuress. Maybe I will add come cayenne to hers and see what happens. Anyway, I read another recipe somewhere that added grated up white chocolate to make it richer. Then, the though occurred that if adding white chocolate is good, then adding milk chocolate as well would only be better. Then I decided that dark cocoa would be nice, because really. Dark chocolate. Right? Right. So it’s not his recipe anymore. Now it’s mine. David taste tested it, and he said “huh. It tastes like a brownie, Mom.” Thus the name. Ingredients! Use real stuff, not fake stuff! 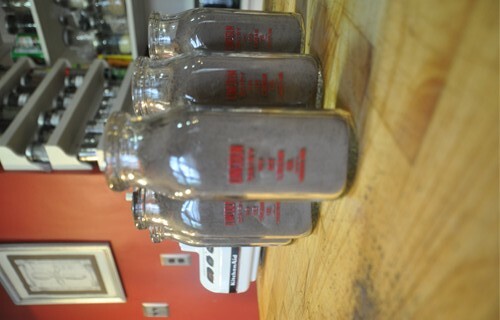 Tastes Like A Brownie, Mom hot chocolate mix. 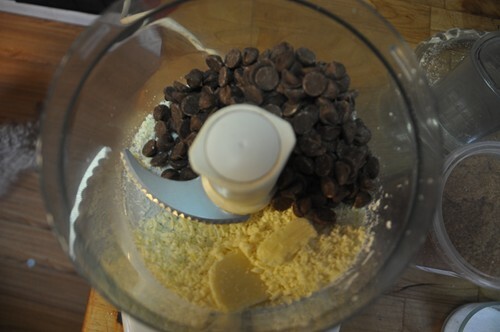 Shred the white chocolate in a food processor. I use the grater disc. Put in the large blade and the chocolate chips. Process until it is all a fine powder. Add everything else (the food processor will probably be pretty full. I know mine is.) Turn it on, and let it mix for a while. How long? Until it’s all mixed and there’s no lumps or bits or anything. Maybe 5 minutes? Something like that. Put it into containers for gift giving! Little mason jars would be perfect! 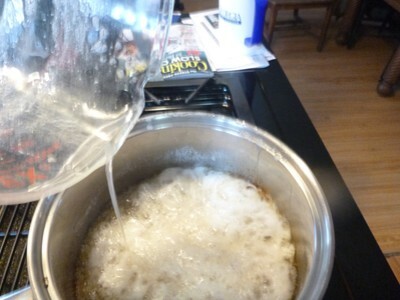 Use 2 heaping spoons full in a 6 ounce cup of very hot water. It needs to be nearly boiling in order to melt the chocolate. You can let it cool a bit after, but the nearly boiling hot is important. Trust me, it’s worth it. When you serve it, stick in a spoon and stir it a bit as you drink it, to keep the chocolate from settling to the bottom. A peppermint stick would make a good stir thing. Marshmallows! Of course! I haven’t made them yet. That is for another day. 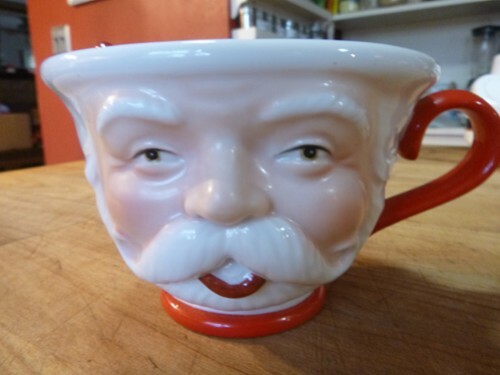 a creepy Santa mug is the perfect thing to serve it in.